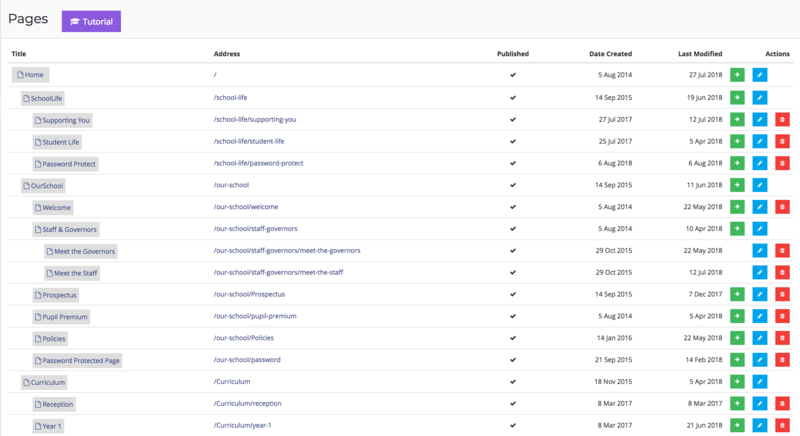 Managing pages is key to a good school website. The Schudio system gives full control over pages. It's important to remember that pages and menu's are separate, and that's by design, it gives more flexibility. Once you have created your page it will not appear on the site until you add it to a menu. Pages can be found under Pages. The top level page is the home page, and all other pages site under that. Each indentation indicates a sub level. In the example above there are 3 pages below home, and some of those pages have pages indented below them. The page structure should reflect the menu structure on the website, it helps to keep pages organised. A page is re-ordered by dragging and dropping. To move a page above another page click and drag the page you want to move and hover just above the page you want to be above. When the thin blue line appears stop dragging and drop the page there. After a quick pause the list of pages will re-arrange and the pages will be re-arranged. To move a page into a submenu drag the page you want to move onto the page you want to a page to be indented below, when a thick blue box around the page appears drop the selected page, and a sub-page will be created. If the sub-page already exists you can drag a page until the thin blue line appears and move the page this way. When you move a page all of the pages indented below it will move with it, and retain the same structure. There's no save button on this page, any positional changes made to pages are saved and applied straight away. A new page can be added by clicking the small green + at the end of a row to add a page item as a sub-page of that page. To edit a page, click the blue pencil in the row of the page to edit. Click the red bin in the row to delete the page. When you delete a page you are asked to confirm this is correct. Please be careful when deleting pages as it is not always possible to retrieve pages that are deleted in error. Below is an explanation of the fields on the Page page. Select from a dropdown list the page that this page will be a subpage of. This is another way to change the order of pages. The title of the page, this appears in the browser at the top of the page on the tab the website is loaded in. The heading of the page, and how it appears on the site. The content box is the main body of the article. This is the same text editor present on most of the editable content pages in the Schudio CMS. For more detailed instructions on using the text box please click here. The url the page will be found at. E.g. www.yourschool.com/page-URL-slug. This field can only contain letters, numbers and the dash/hyphen (-) character. The URL will populate itself as you type the page title. Set the meta keywords for this page. Don't worry if you don't know what a meta keyword is, it's primarily used for improving the site's search engine ranking. Set the meta description for this page. Don't worry if you don't know what a meta description is, it's primarily used for improving the site's search engine ranking. Only applicable to specific designs to set a individual image for pages. This usually applies to the header image of the site. Send us a message if you would like to know if you can choose a different image for your design. This is in relation to the header image above. On certain designs you can choose between two header sizes. 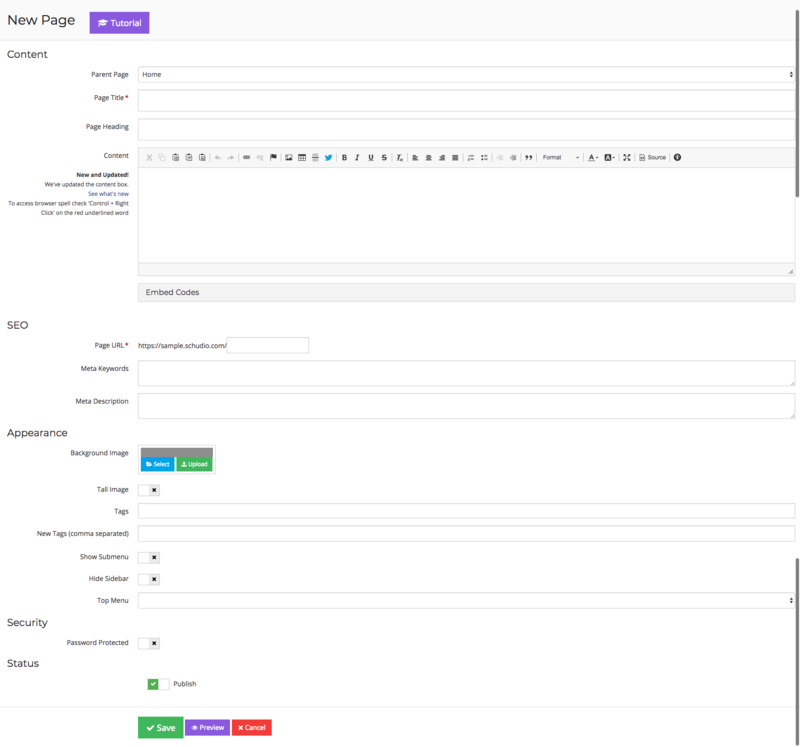 The tags box allows categorisation and tagging of pages to link related content together. For more on tags click here. If you want to create a tag to use for the first time, enter it in this field. This will create the tag for future use. If your theme needs the specific option to enable a page to display a submenu ticking this box will enable any applicable submenu. To give increased flexibility over the layout of pages there are additional options to hide or display the sidebar within a specific page. This is really useful if creating Landing Pages to be used for funnelling visitors to a specific outcome, such as registering for an event or completing a form. Following on from the Hide Sidebar options, there is an option to display a different menu at the top of this page. This is also very useful to remove distractions from Landing Pages if attempting to funnel website visitors. 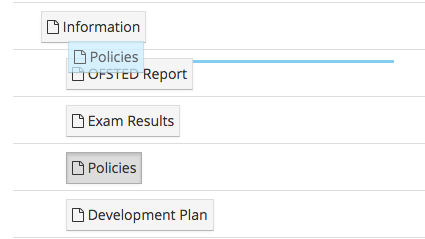 Add new Menus for them to be available here to select within the dropdown. Create a menu called Blank with no menu items and the main menu is removed from the page to really focus visitors. Enable password protection on a page to lock out visitors who do not have member login details. Create member user accounts in the system to manage access to password protected pages. For more information see the Adding a User tutorial. The publish checkbox is ticked by default and allows the page to be shown on the site. If the enabled checkbox is not ticked the page will not be visible. Click save to save any changes made to this page.